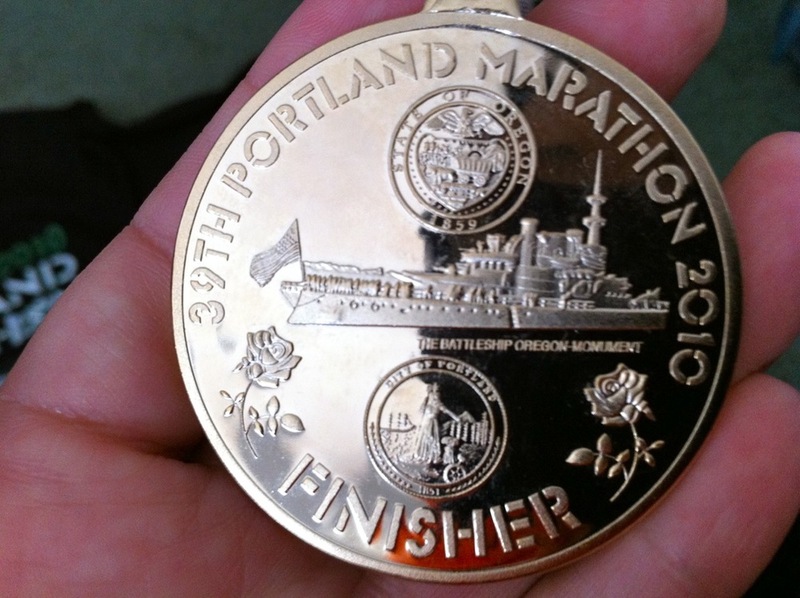 In the weeks leading up to the Portland Marathon, I was having a lot of pain in my legs. I saw my doctor regularly where she diagnosed me with tarsel tunnel syndrome in my left leg. Just when we’d gotten it under control, my right calf started giving me problems. Not only did it affect my training, it also brought down my psyche. I was frustrated, depressed and unmotivated. I stopped looking forward to my runs and emotionally detached myself from this race. I actually considered not even running it at all. I mean, between my physical and mental states, and the fact that my San Francisco Giants were going to be playing in the NLDS while I was scheduled to be in Portland, I really wanted to No Show. 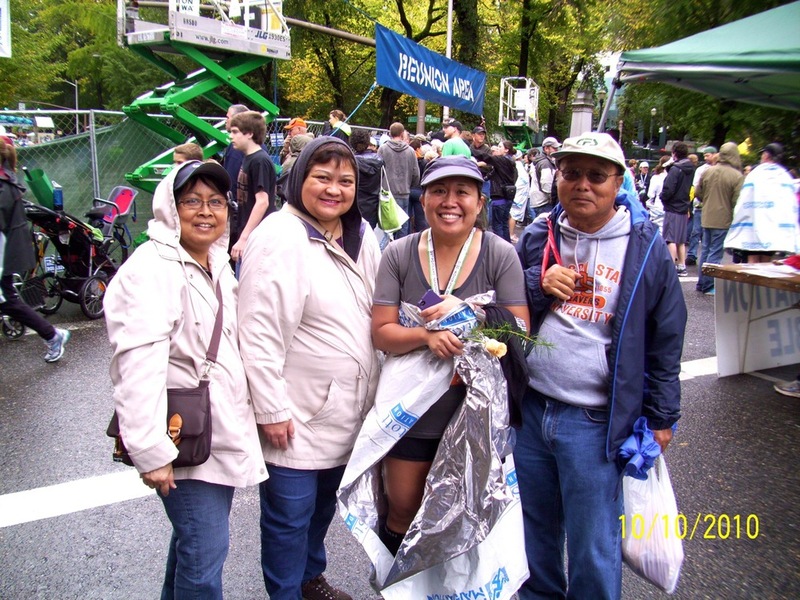 The only thing that kept committed was that my parents were flying in from Hawai’I, some aunts were flying in from Alaska, and another aunt and uncle signed up to do the 10K. Had my family not invested in supporting me, I would’ve foregone it. Truth. As obsessed as I had been with the first marathon I ran, I avoided this one. The only detail I concerned myself with was that I had 8 hours to finish it. I didn’t want to talk to anyone about running, didn’t want to read running magazines, running blogs, or anything related to running. But as the race drew closer, Dr Eva, my chiropractor told me that I was physically fine to run it. A runner herself, she suspected that I was having mental blocks about it, and she was right. Deep down, I knew I could do it, but I had a lot of apprehensions, mostly because I was afraid I’d cause myself more injury in the short time I had leading up to the race. A few days before I left for Portland I received a package from Amazon that contained a book by Dean Karnazes. Dr. Eva had ordered it for me to give me a little bit of inspiration. I haven’t read it all yet, but the few bits that I have read, did boost my energy level and I found myself at San Jose airport last Thursday, eagerly awaiting my flight to Portland. When I arrived at my aunt’s in Vancouver, WA (15 minutes outside of Portland), the first thing we did was make plans to go to the expo on Friday morning. Her excitement about the 10K was contagious and I could feel myself getting more into it. One of the reasons I chose Portland was because I had read that the whole city comes out to support it. After the fiasco of a race the Marin Marathon turned out to be, I wanted to participate in a big race that had a lot of support. I had read that there would be 10,000-12,000 athletes running the full, with about 3,000 running the half. Based upon this, I thought the expo would have been fabulous. But in all honesty, it wasn’t. Don’t get me wrong, it was well-organized and such. I mean, I didn’t have to wait more than 5 minutes in line to get my bib/chip. I even got a few pieces of race merchandise, but it just wasn’t spectacular. I think its because it was in the basement of the Hilton. Like, in the dumps. But oh well, that’s just my opinion. The swag was pretty good – a race shirt, a rose pendant, a race coin (not quite sure what I’ll do with it), a program, a race poster, bag, etc. But the one thing that proved to be a lifesaver was the free mini Lara bars. Despite the evil eye of the person running the booth, I scooped my hand in the jar and grabbed a handful of them. I can’t remember having them before, so I’m not sure why I did that, but I’m glad I did (more on this later). I didn’t love any of the possible shirts I had packed to run in. I had visited Niketown in San Francisco, and Lululemon in Burlingame before I left and didn’t see anything I liked. Neither did I see anything at the expo. So I made one last ditch effort to find something at the Lululemon store in the Pearl District…and I did! 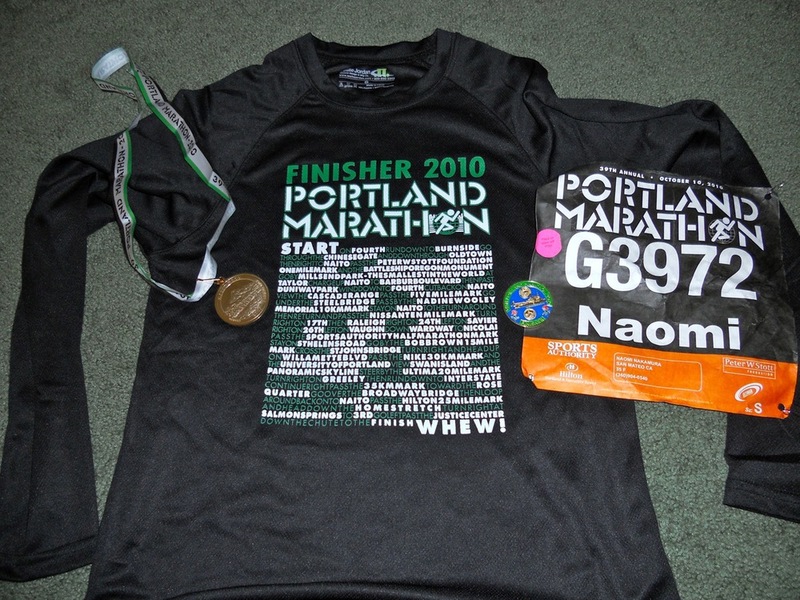 They had made a running shirt exclusive to the Pearl District store, just for the Portland Marathon. But of course I was a sucker for this and purchased it. It was made with the same material as the tank I used for Marin so I knew it would hold up well, even in rain. I spent the rest of the day lounging around, hydrating and trying to nap (which didn’t really happen). The down time gave me a brief moment to get nervous, especially about the rain. But during a “Words with Friends” game, Aron had sent me a message that once I read it, put me at ease. I had spaghetti for dinner, and I turned in early, before 9 pm. Despite waking up a few times during the night (all that hydration), I woke up about 30 seconds before my 4 am alarm went off. Chip, the family jack russell terrier rolled over and gave me an, “Are you even kidding me?” kinda look. The first thing I did was look outside to see it was a rainy mess. I found myself second guessing what I should wear, so I decided to layer and make the final decision when I got to the starting area. I ate a heaping bowl of oatmeal + walnuts, and a banana for breakfast and was ready to go by 5:30 am, just as the rest of the family was getting up. We piled in the bitchin’ big rig and was on the road by 6 am. Surprisingly, we had no problems getting downtown. In fact, we were parked in a really close parking garage within 20 minutes. 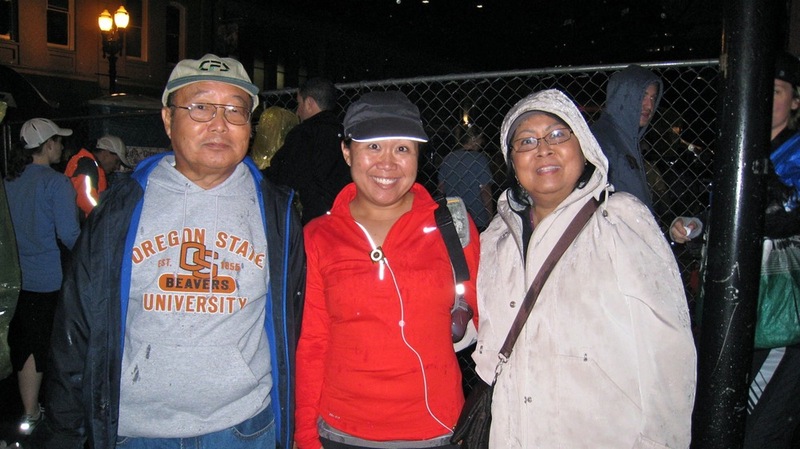 My family walked me to my corral, wished me well, then took off for drier conditions. The corrals were sectioned off by blocks, and the runners in my corral were all huddled under awnings, trying to stay as dry as possible. I, on the other hand, stood in the rain in the porta potty line. By the time I had taken care of business, I was already drenched. The temperature wasn’t cold (at least not to me), so I checked in my pullover to gear check and found a spot under an awning. I chatted with a few people who were running their first half, but before we knew it, it was our turn to move up to the Start Line. The corral police were in full effect, so I have no idea how walkers got ahead of us. I mean, they had an entire corral dedicated to them. But there they were, and as usual, the first few miles were spent maneuvering around them. Seriously, a huge pet peeve of mine. I promised myself to take it easy and not get too hyped and go out too fast. Well that hill in the first few miles made sure that happened. I found a lady that was going a comfortable pace so I positioned myself behind her and kept pace with her (she had no idea) for the first few miles. I had driven most of the course during an earlier visit during the summer, so I was fairly familiar with it. Running along Naito in the downtown area was fun, I’d say equivalent to running along the Embarcadero in San Francisco. Although I wore a 2-bottle fuel belt (I wish I hadn’t because it killed my back), I still stopped at every aid station, alternating between Ultima and water. I had trained drinking Ultima and knew I would have no problems with it. (BTW, the lemonade flavor is way better than raspberry). The aid stations were plentiful and well-staffed. The gummi bears and Vaseline were much appreciated. As we moved out of the downtown area into the industrial one, we had to be careful of the rain puddles. Every time I stepped in one I cringed. My feet were completely soaked. In fact, it rained so consistently, that I was completely drenched the entire time. Surprisingly, this didn’t bother me at all. I wore a hat, which kept the rain off of my face, which was all I needed. Eventually, I found myself completely grateful for the rain that kept me cool. And not once did I feel cold. The industrial area of the course was an out and back, which I usually hate. But this time, I didn’t mind it either. It kinda went by quickly and before I knew it, I was at the turn around. One of the challenges I have on long runs is hunger. I get so hungry that I just want to die. I had a bunch of Hammer gels with me and had one at Mile 5. But at Mile 10, my stomach was rumbling, so I whipped out one of those mini Lara bars I picked up at the expo. I found that I couldn’t chew and run at the same time (hold the comments on this one), so I took a walking break while I ate it. Seriously, I think I solved my whole hunger issue. I felt pretty awesome about that. I don’t know why, but when the course split with the half-marathoners, I lost a little bit mentally, and suddenly became fixated on the bridge. In my mind, I had told myself I just needed to get to the St. John’s Bridge at Mile 17, and then it would be smooth sailing from there (foreshadowing). As we ran through neighborhoods, I kept looking and looking for the bridge and just didn’t see it. Finally, I took my earphones and yelled to anyone who would listen, “Where’s the bridge?! ?” At that moment we made a turn and a guy pointed and it came in to view. But first, there was the climb up to the bridge. Even with eating a Hammer gel at Mile 15, I could feel myself tiring. I also could feel an issue developing in my right glute/hip. I ignored it and trudged up the hill. Everyone around me was walking and so I said, “Screw it” and I walked too. At one point I walked over to the sidewalk to try and stretch out my right side. It didn’t feel good. I tried to start running again, but I felt like I was one bad step away from completely cramping up, so I walked the rest of the hill. Once we got to the bridge, I realized that the bridge also has an uphill. I cursed. But I started running again and then indeed did cramp up. Not as bad as I thought it would be, but a cramp is a cramp. Once I got to the peak, I suddenly had this really weird sensation come over me. I felt very clammy and my hands suddenly felt numb and swollen. It scared me, so I took off running to fight it off. Now I have no idea why I thought that once we were off the bridge, the rest of the way was going to be downhill – because it wasn’t. There was a mini-incline off the bridge, and then it was flat. But from that point on, my right side was toast. I pushed as much as I could, but it just wasn’t cooperating. So for the rest of the way, I ran 3 minutes and walked 1. But this is the area of the course that ran through some really nice residential neighborhoods. The people who lived here came out to support. And I love every one of them! Our bibs had our names on them so they would call out your name, cheering for you. I swear, I felt like I had so many friends out there. At one point, I saw a couple yelling, “Go Naomi, you got this!” I slowed down and asked them, “Isn’t this the third time I’m seeing you guys?” and they said, “Yes! We’ve been following you all along the course!” I swear, at that moment, they were my favorite people in the whole world! Spectator support does make a difference! In fact, I was hi-fiving everyone I saw wearing orange, thinking, “Wow, there’s a lot of Giants fans here!” Then I realized that the Oregon Beavers are orange also. LOL. At Mile 20, just as I took out my second mini Lara bar, I saw a tent set-up where they had donuts, pastries and bagels. I don’t even know if it was an official aid station, but I do know that they were god sent! 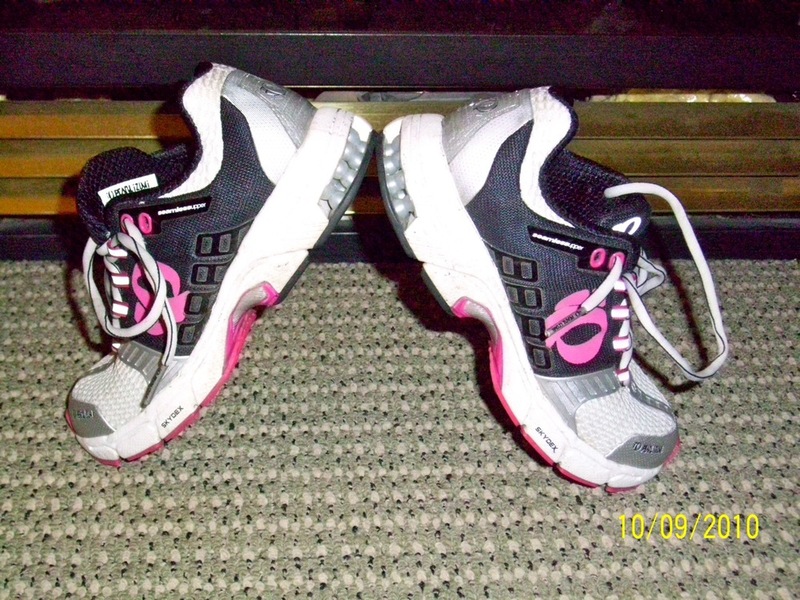 Every runner out there LOVED them! I wolfed down half a bagel and picked up the run again. I knew I only had a 10K left, but it was the longest 10K of my life. My feet hurt, my back hurt, my right glute and hip were screaming. It was becoming difficult to even run for 3 straight minutes. But then we hit the downhill and I found a little something in me and ran that whole mile. Then it got flat again and I resumed the 3-min run/ 1-min walk thing. It also helped me mentally because it kept my mind on paying attention to the time and not think about dying a slow death. Cheesy alert: At Mile 24, I didn’t think I had anything left, but then Journey’s “Don’t Stop Believing” came on my iPod. The week before, Steve Perry (himself a Giants fan) had made an appearance on the scoreboard at AT&T Park during one of the Giants’ final regular season games and the place went wild. I’ve been going to AT&T Park regularly for the past 10 seasons and that moment was one of the all time inspirational moments. In fact, Giants fans even made this video with the song. That got me through Mile 24. Knowing I only had 1 mile left, I willed myself through it, practically counting down the minutes that I had left before I could stop. But then my Garmin read 26.2 and the Finish Line was nowhere in sight. I got mad. REALLY mad. Why the heck do races do this to us?! Everyone was yelling my name to keep going because I was “almost there.” Grouchy as I was, I was thought, “Oh, I’ve already done 26.2, this extra is just torture!” I asked a guy where the Finish Line was and he told me 4 more stoplights. But when I got to the 4th stoplight, the sign read “26 miles.” Liars. There were 2 more turns before the Finish Line came into view. And finally, 5 hours and 11 minutes later, 43 minutes faster than my first marathon, I crossed it. I collected my blanket, medal, rose and tree seedling; downed a box of orange juice in 2 gulps, ate a bagel, banana and bag of Fritos, then got my Finisher’s shirt. Yes, a second shirt! 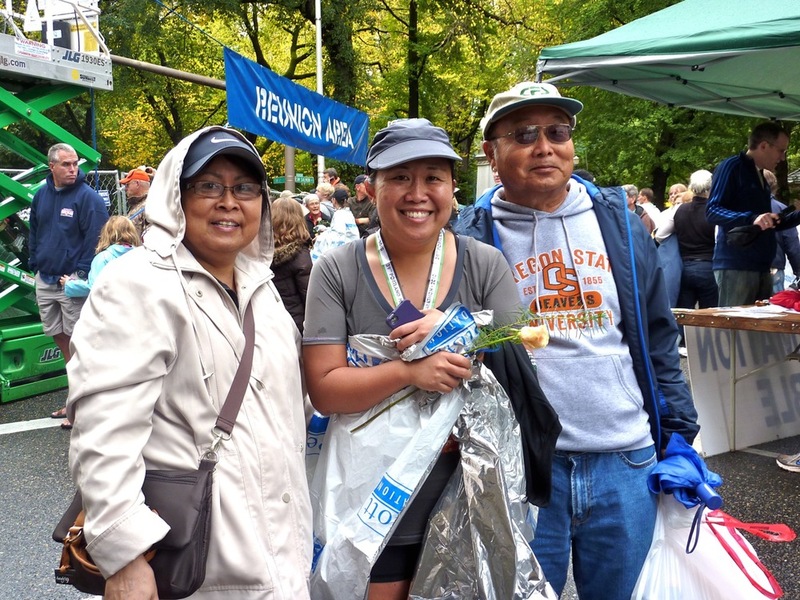 I stood in line for my Finisher’s photo, collected my soggy pullover from Gear check, then made my way to the Reunion Area where my family was waiting for me. After taking photos, we walked back to the parking garage and headed home. I took an ice bath, got cleaned up, then ate practically everything in sight. In reflection, I think it was a pretty darn good experience. The race itself was very well-organized. 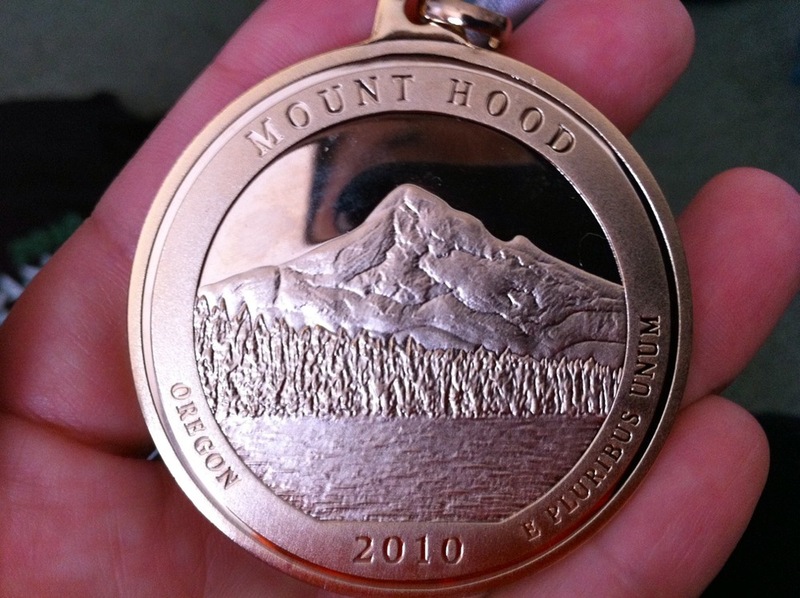 The course was great – I mean, reaching the top of the St. John’s Bridge and looking over the Willamette River was amazing. I wish I hadn’t been so spazzed out so I could have enjoyed it more. I can’t say enough about the course support – the City really does come out to support – they were fantastic! 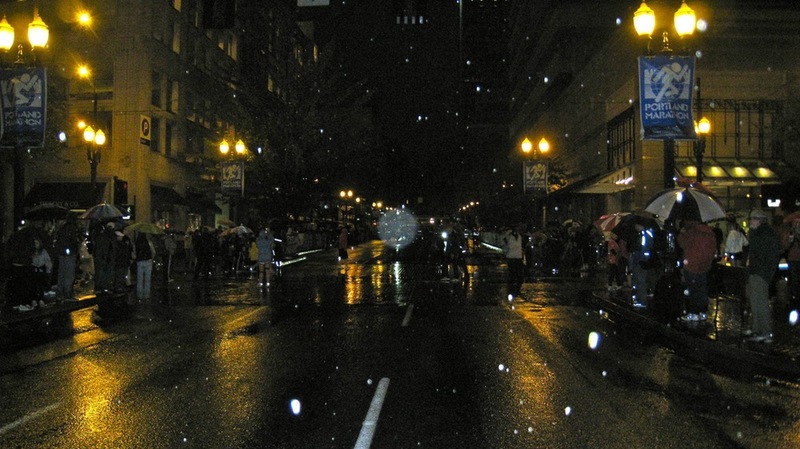 And the rain – well I think it made us all feel badass. Exhilarating is the best word I can use to describe the experience. 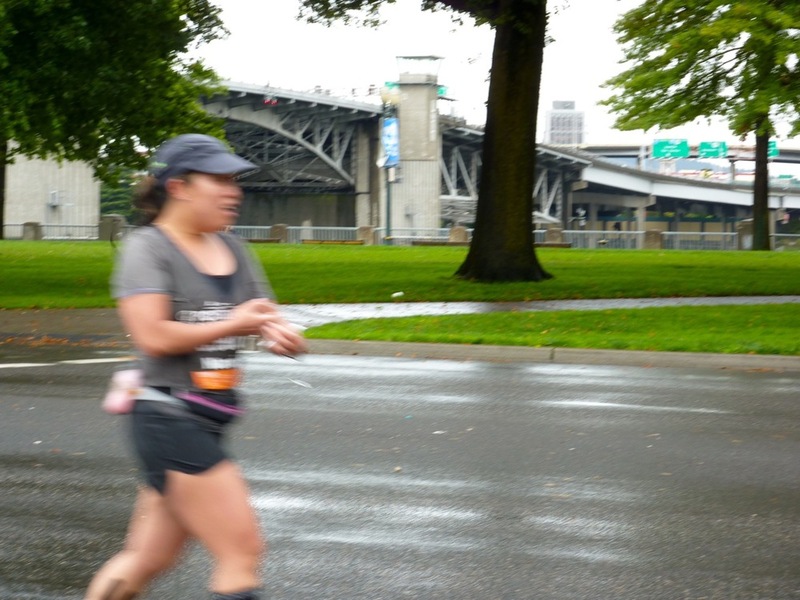 I managed to get through 5+ hours in the pouring rain with no chafing and just a tiny blister that was gone by the next day. But I'm not gonna lie, the rest of me was (still is) sore. Stairs are the enemy. I walk down them backwards. But I will say that I am not as sore as I was after the first marathon. I spent the past 2 days icing, stretching, walking and even got a massage. I am still moving along gingerly, but should be fine by the end of the week. I am really glad that I stuck to the commitment to run this. I have no regrets (especially since the Giants won the NLDS and there will be more baseball at AT&T Park this October). I would definitely run this race again. Someday. I can’t think of when I want my next race to be. I need a mental break from thinking about it. So for now, I’ll just enjoy this experience, and appreciate all of those who helped me along the way to cross the Finish Line. You know who you are, and I am so grateful for each and every one of you!